At some point in time, every company faces a decision when to replace existing equipment with a new one that came on the market. When any project investment decision is involved, it is recommended to evaluate attractiveness of the investment decision based on investment Net Present Value. Net present value rule recognizes the time value of money: the fact that a dollar today is worth more than a dollar tomorrow. Today's dollar can be invested right now and start earning interest right now. New equipment needs to be the best possible alternative to the existing equipment and it needs to be placed in use at the optimal point. As result, the length of use of existing equipment and new equipment can be different. 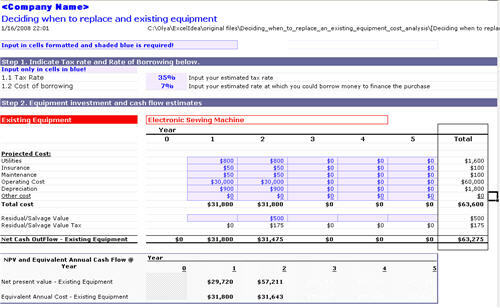 Existing equipment and New equipment will produce steams of cash flows with different lengths or time pattern. 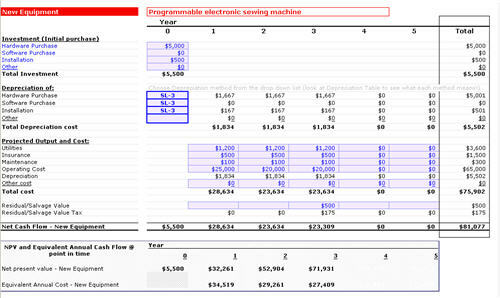 These cash flows cannot be compared solely on the basis of net present value. Net Present Value needs to be converted to equivalent annual cost. Equivalent annual costs of existing equipment and new equipment are annuities (assets that pays fixed amount of money each period) with the same net present values. This model is designed to calculate the optimal point of replacing existing equipment with new equipment based on evaluation of equipment cost only. You will have clear step-by-step instructions where and what requires your input. As an example, the model includes analysis of replacing existing electronic sewing machine with a new one. It assumes that I saw an advertisement featuring a new programmable electronic sewing machine coming out on the market next month. Output of the new machine is higher than that of my existing machine. I would like to analyze should I replace my existing machine and if yes, when? You can easily substitute your numbers into the model to analyze various projects. ExcelIdea.com offers consulting services in creating custom solutions or upgrading your existing company spreadsheets. No request is too big or too small. Learn more . Copyright @ 2007 ExcelIdea.com All Rights Reserved.